Tovala Meals are the end result of a long and careful process. Our goal? To make sure any meal of ours makes a big impression but never feels like a big deal to make. How do we get started? By getting hungry, getting creative, and then making sure the rest is history (or dinner). Long before youâ€™re ordering Tovala Meals, our chefs are creating recipes in our test kitchen. Getting to the final product is less a singular â€œaha!â€� moment and more a process of cooking, tasting, and adjustingâ€”and then when everything comes together, a celebratory final fist pump. 1. How can we create a recipe that features big, bold flavors and interesting textures? 2. How can we maintain the essential balance between healthiness and deliciousness? 3. How can we make a Tovala cook cycle and par-cooking plan that will cook every component to perfection? Sometimes this process is more of a challenge. Take our Szechuan Eggplant Tofu. Our chefs wanted to feature szechuan peppercorns, an invigorating flavor element that numbs the mouth slightly before introducing a little heat, but they needed to come up with a side that could stand up to such a powerful sauce. Sesame ginger brown rice and green beans seasoned in a flavor-packed blend of sesame oil, chili flakes, and garlic ultimately won out, thanks to their delicious combination of stir-fry flavoring all-stars. 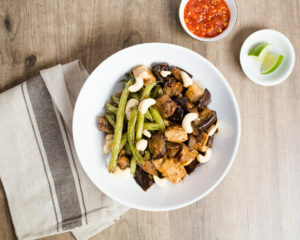 Once the flavors were there, it came down to making sure everything from the soft eggplant to the crunchy green beans were cooked perfectly. Stir-fry is usually made in a wok, not an oven, so how do you switch cooking methods so drastically without compromising the dish? A tough question, but coming up with the answer wasnâ€™t magic. In situations like this, our chefs combine their cooking prowess, their knowledge of the Tovala, and a lot of hard work to experiment with par-cooking techniques, as well as the Tovalaâ€™s unique ability to steam, bake, and broil. When their experimentation is done, weâ€™ve got a test kitchen full of really good smells and a Tovala Meal ready for you to order. While youâ€™re deciding which meals youâ€™d like by our Wednesday at 6:00 p.m. CT ordering deadline, weâ€™re ordering ingredients and prepping your meals so you can receive them the next week. Weâ€™re careful to order only what we need to reduce food waste. We also use exclusively â€œcleanâ€� ingredients to make your meals. What does this mean? Say your grandmother opens up your fridge and grabs a Tovala Meal. When she reads the ingredient list, it means that sheâ€™ll recognize every single one. We believe real ingredients make for better, healthier, and more delicious meals. When the fresh ingredients weâ€™ve ordered arrive at our food prep facility, we get to work all over again. Prepping includes a lot of tasks, like making sauces, cutting vegetables, marinating chicken, rolling meatballs, and par-cooking certain ingredients. If youâ€™re new to the term, par-cooking just stands for â€œpartially cooking.â€� Itâ€™s something that happens at just about every restaurant youâ€™ve ever been to. The green beans on the plate next to your steak? Par-cooked before you even arrived. The chef only finishes cooking them after you order. They do that so they can get to your plate freshly cooked, while making sure the chefs are using their times efficiently during the dinner rush. We utilize par-cooking a little differently. For example, if weâ€™re making a meal with a chicken breast and sweet potatoes (which take much longer to cook), weâ€™ll par-cook the sweet potatoes so they can cook alongside the quicker-cooking chicken in your Tovala. Thatâ€™s how we cook both ingredients perfectly in 20 minutes or less! Once ingredients are prepped, placed in the proper trays, sealed, boxed, organized, and labeled, your Tovala Meals are ready for the trip from our facility to your home. They also travel in style, nestled in insulated boxes with cold packs so theyâ€™re fresh and ready to be cooked or stored in your fridge. You receive your meals on Tuesday or Wednesday, and youâ€™re all set to eat and enjoy! This is our favorite part because Tovala Meals are in your home (and eventually your stomach), making your work week easier and tastier. Theyâ€™re doing their jobs! Our always-changing, ever-evolving menu means that the work is never done for our talented chefs. They keep on brainstorming, keep on tasting, and keep on creating so the next week, youâ€™re set to keep on eating better without any hassle. Check out some of our favorite Tovala Meals here!